Those little dry creek beds at our parks, recreation centres and schools are more than just decorative elements. Deborah Jones (centre) of the Cougar Creek Streamkeepers helps the kids at Trinity Lutheran Church’s day camp build a rain garden on nest to the century-old sanctuary on Aug. 26. They’re becoming an ever more common sight at our parks, schools and other community spaces, these little dry creek beds lined with ferns, flowers, bushes and trees. But these rain gardens, as they’re called, are more than simple decorative elements to spice up a boring piece of lawn; they’re helping to make our streams and creeks healthy year-round. Simply put, a rain garden is any landscaping that receives and soaks up rainwater runoff from an impervious surface such as a parking lot, street or roof. Deborah Jones of the Cougar Creek Streamkeepers organizes and constructs rain gardens in the area, including builds done in partnership with the Corporation of Delta and the Delta School District. “The idea of a rain garden is instead of wasting rain water from a roof or a parking lot or a street down a pipe, out to a creek and out to the ocean within a couple of hours, instead we’re going to use nature’s free reservoir, which is the ground, to store that water,” Jones said. In most cityscapes, this water is funnelled into drains and piped away. This leads to chronically low levels of groundwater in the hot, dry summer months and, in turn, to low water levels in local streams and creeks, causing water temperatures to become dangerously high and threaten fish survival. On the other side of that coin, whenever it rains a flood of stormwater runoff enters local waterways via catch basins and culverts, carrying with it pollutants that can harm fish health, and sediments that can suffocate spawning gravels where salmon have laid their eggs. As well, the high volume of water rushing by can wash away fish eggs, erode streambanks and destabilize the stream-side shade trees that are critical for salmon survival. To help keep groundwater levels high enough to sustain our creeks year-round and to help filter the water entering our waterways, more people and businesses are building rain gardens. 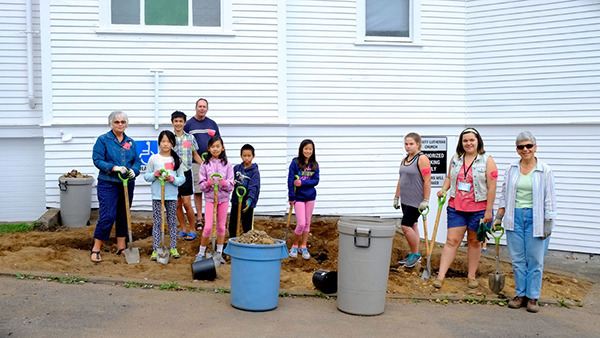 Recently, the children at Trinity Lutheran Church’s day camp helped Jones build a rain garden next to the century-old sanctuary. Wilson said the experience of building the rain garden has been a positive one for the kids. With about two acres of forest on church grounds and Norum Creek running basically under the building, she says it’s been a good opportunity to teach them about the natural world hiding in plain sight. Later in the month, Jones will be helping students at Gray Elementary plant their new garden, located in a boulevard strip in front of the school. 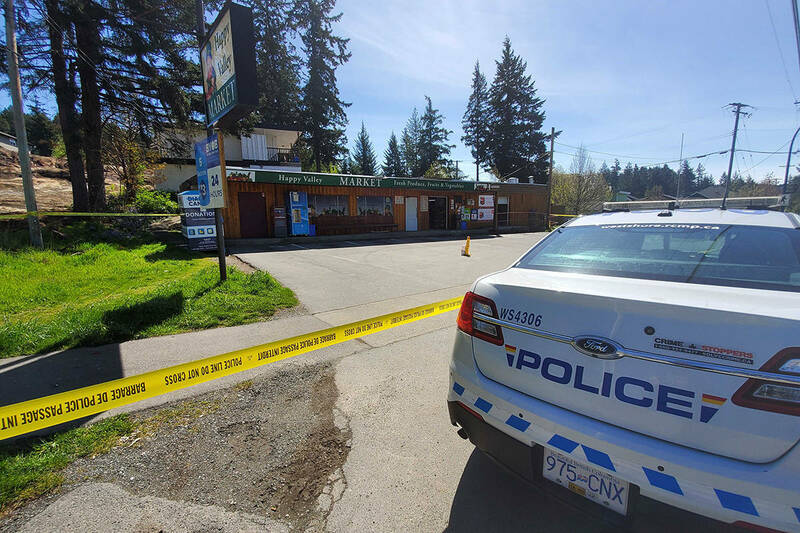 Plans are also afoot to construct one in the 80th Avenue right-of-way behind McCloskey Elementary, pending the final okay from BC Hydro. If it goes ahead this fall, then McCloskey students would likely plant in late October or early November. Although the increasing interest in rain gardens is a step in the right direction, Jones acknowledged that we have a long way to go before our urban streams and creeks function the way nature intended. 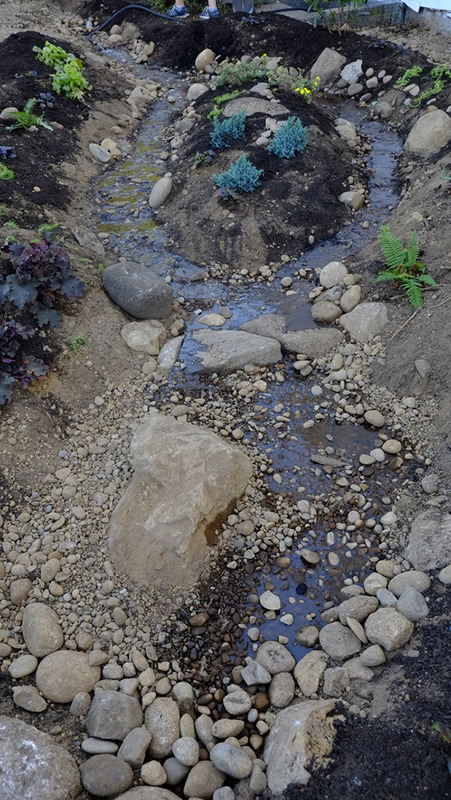 For more information on North Delta’s rain gardens, visit the Cougar Creek Streamkeepers website at vcn.bc.ca/cougarcr.